Accessibility isn’t dark magic. Most of it comes down to using meaningful (semantic) HTML5. 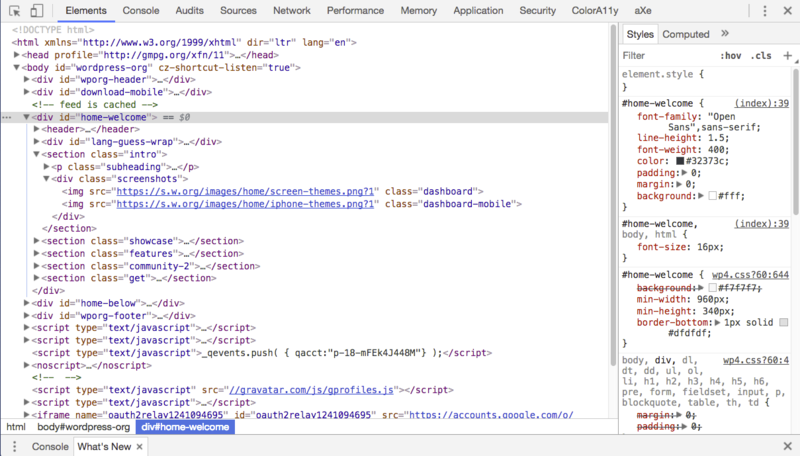 If you inspect a page with the inspector of your browser you can see the DOM. And the DOM must make sense. HTML5 landmarks like <header>, <nav>, <main>, <aside> and <footer> give structure to a page. Headings (<h1> up to <h6>), paragraphs (<p>), images (<img>), lists (<ul> and <ol>), and for example quotes (<blockquote>) give meaning to the content. Buttons(<button>) and links(<a>) add interaction with the page. When you use the right elements for the job, your site works better on all devices. You can always change the way they look by using CSS if the native view of an element is not to your liking. Note: Adding <h1>s to every <section> in a page, as proposed in early HTML5, is no longer valid, because no browser supports the HTML5 outline. Use of this model hinders screen reader users in understanding the web page. If you’re not convinced, read Computer says NO to HTML5 document outline by Steve Faulkner. // Incorrect, a div doesn’t get keyboard focus. // Also incorrect. You should use <a> only for a change of location, not to invoke an action. // Correct, works on every device. // from vision, use the screen-reader-text class. Read more on the screen-reader-text class. It’s harder to check if your HTML is meaningful, because this highly depends on the content of your web page. Use common sense: search for the right element for the content and don’t suffer from Divitis. If you are a developer, consider what ends up in the DOM, because that’s what your users and their technology will receive. Take the time to study and learn HTML5 thoroughly.